I've been on the lookout for a linen table cloth and napkin set to use at Christmas, but I couldn't find any for less than $90! I decided the next best thing would be to make my own. Ikea has an affordable linen fabric, Aina, for sale usually but it's been on backorder for a few months, so I ended up buying their Lenda 100% cotton fabric which is a good weight and has a slightly noticeable weave that looks similar to linen. 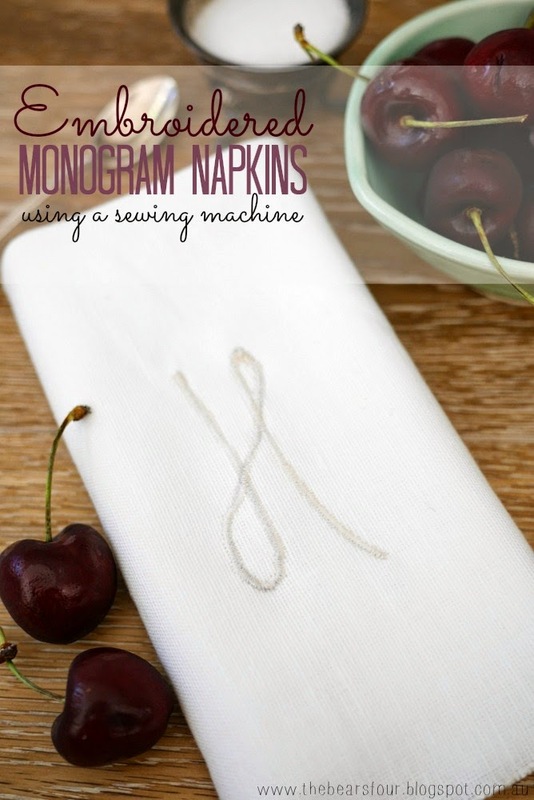 I wanted to personalise the napkins but I didn't want to invest in taking them to a monogram shop so I came up with an easy and inexpensive way to do it myself. Click below for directions. Step 1: Using the paper and pencil, design the monogram letter you want to embroider. Step 2: Place the paper under your fabric napkins and trace the letter in pencil or fabric pencil onto the material. Step 3: Tread your sewing machine and set the stitch to zig zag. I set my machine to a very short tight stitch. Cut a small rectangle of interfacing that covers the size of your letter. Place the interfacing directly behind the letter on your fabric. The interfacing is used to keep the stitches from pulling. Start at the top of your letter and zig zag stitch following along the line you've drawn. Take your time and set the sewing machine speed to low so you avoid making any mistakes. Step 4: Make sure you sew a few stitches in reverse at the start and end of your letter to lock the tread in place. Once you've completed the letter, turn your fabric over and either carefully tear or cut the interfacing away from the stitches. Step 5: Trim the excess tread at the start and end of the letter. Iron and fold each napkin. Simple, inexpensive and it only took around 30 minutes to monogram four napkins. These would make a great host and hostess present for Christmas.